The Ecosystem Enhancement Program is a $10-million initiative to help maintain and improve ecological health. (Columbia Basin) – Five large-scale projects will be significantly improving ecosystem health in the Columbia Basin, bringing areas closer to their natural states and improving habitat for many species. The projects are being initiated and supported through Columbia Basin Trust’s (the Trust) Ecosystem Enhancement Program. The Ecosystem Enhancement Program is a $10-million initiative to help maintain and improve ecological health and native biodiversity in a variety of ecosystems over five years. The Trust identifies projects by seeking input from community groups, First Nations representatives, government experts, and reviewing regional plans and research. The Trust will be seeking opportunities this fall for the Lower Columbia and Elk Valley regions. Learn more at ourtrust.org/ecosystems. After a century of fire suppression, the many forests in the East Kootenay are thick with dense stands of timber that compromise values for many species, and provide the potential for catastrophic wildfires. To return the stands to healthier, more natural conditions, the ʔaq̓am project will involve thinning forests and using prescribed burns on 1,300 hectares on ʔaq̓am reserve lands over the course of five years. Near Creston, Six Mile Slough provides habitat for waterfowl, amphibians and more. Its ecological value has been greatly reduced because of modifications to the wetland since the late 1800’s for agricultural and wildlife management purposes. 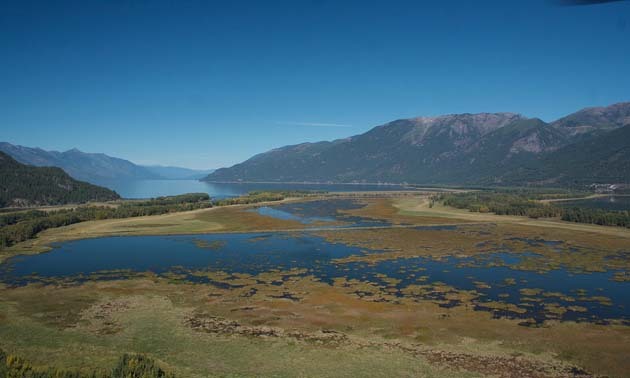 This project by the Creston Valley Wildlife Management Area will see the modification structures removed, over 1,260 hectares restored to a more natural state and the slough reconnected to the Kootenay River. At home in the subalpine, whitebark pine is a long-lived tree species—except when its survival is being threatened by white pine blister rust. The Nature Conservancy of Canada and the Ktunaxa Nation are working together to help restore this endangered species that plays an important role in mountain ecosystems. Primary activities involve collecting seeds from uninfected trees, growing seedlings in greenhouses and planting them in the South Selkirk Mountains overlooking Kootenay Lake. At the confluence of the Goat and Kootenay rivers near Creston, over 500 hectares of land make up part of the yaqan nukiy traditional hunting grounds. But this landscape isn’t as healthy and diverse as it used to be. Using aerial photographs from 1929 and the knowledge of Elders, the Lower Kootenay Band will be revitalizing wetland, stream and riparian habitats in this culturally and ecologically important area. “It’s a really special place in the entire Rocky Mountain Trench.” That’s how Richard Klafki of the Nature Conservancy of Canada (NCC) describes the grasslands in the Wycliffe Conservation Complex. Located between Kimberley and Cranbrook, the area is home to true grasslands, which are rare in the Basin. 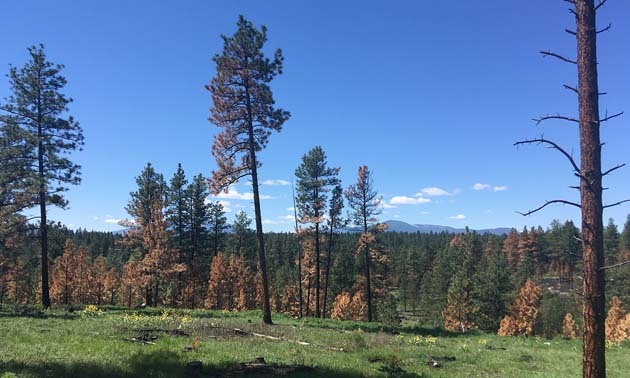 Historical activities on the landscape have led to less than optimal conditions for species in the area, ranging from elk, deer and badger to rare plant species. Through a partnership between NCC, the Nature Trust of British Columbia and the BC Ministry of Forests, Lands, Natural Resource Operations and Rural Development, the over 1,100 hectare area will be restored and enhanced to a more natural state. This will be done through activities like thinning the overgrown forests, riparian and wetland restoration, stream enhancement and removing invasive plants. The Trust also helps Basin residents and groups address environmental priorities through programs like Environment Grants, the Grassland and Rangeland Enhancement Program, the Invasive Species Partnership, and the Climate Action Program. Learn more at ourtrust.org/environment.